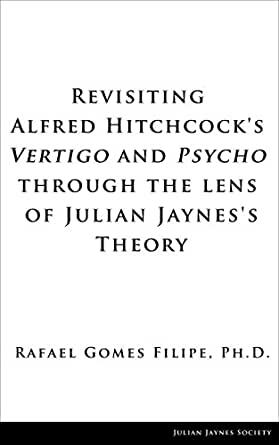 Revisiting Alfred Hitchcock's "Vertigo" and "Psycho" through the Lens of Julian Jaynes's Theory offers a first reading of Hitchcock’s feature films Vertigo and Psycho by means of conceptual grids drawn from Julian Jaynes’s groundbreaking book The Origin of Consciousness in the Breakdown of the Bicameral Mind, and from supplementary books published by The Julian Jaynes Society. This approach allowed for a new, cogent reading and a deeper understanding of pivotal scenes, shots and images of both films, bringing to light secret layers of meaning and solving some nagging “mysteries” never satisfactorily explained by the Hitchcock scholars. If Julian Jaynes’s theory of the bicameral mind was recently crucial to the unlocking of HBO's Westworld, Professor Gomes Filipe’s book, on the other hand, offers a breakthrough in the field of the Hitchcock studies, where traditional academic approaches seem to have exhausted their capabilities. Hitchcock’s understanding of the unique role of emotions to control the audiences, together with the fact that the study of consciousness is now gaining in popularity in neuroscience labs around the world, are among the factors that give a new momentum and impact to Professor Gomes Filipe's approach. Indeed, the rich grid of Jaynesian concepts he selected allows for a new, highly cogent and surprising close reading of two Hitchcock masterpieces, feature films Vertigo and Psycho.